When David + Lisa turned around to face their families and guests moments after they officially tied the knot, the looks on their faces were pure gold. David was nearly overcome with emotion, and Lisa beamed with the brightest smile we'd seen all day. They have a "Brady Bunch" family, with three kids on each side, who all stood with their parents proudly and were thrilled to bear witness to this wedding day. 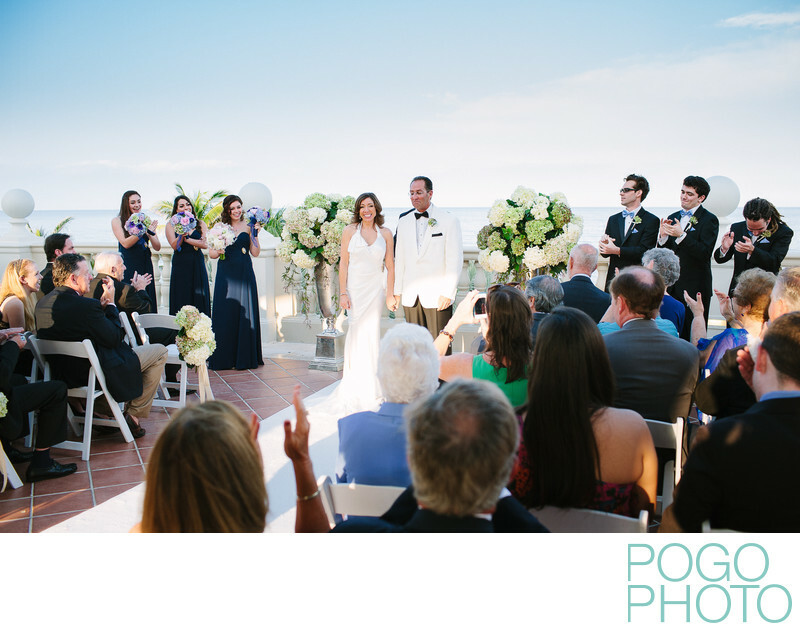 The Breakers is a quintessential Palm Beach wedding location, but this particular ceremony spot is not as commonly used as the lawn (which is just to the left and a story or two below this rooftop location). We love this vantage because it places everyone watching in a perfect spot to catch the sea breezes, and it feels like a private castle in the sky, hovering over the brilliant turquoise ocean just beyond the wall. As with many secular outdoor weddings we are able to move about quietly and take a variety of positions to get the widest range of faces in our images– not just of the married couple, but also of their dear loved ones who are watching from their seats. Lisa's beautiful satin wedding dress hugged her curves and fit like a glove, accentuating her beautiful figure while avoiding the strapless style she wasn't interested in. David's choice of a white dinner jacket with black bow tie set the couple apart from the bridesmaids (in navy gowns) and the groomsmen (in black tuxes with blue bowties). 1/640; f/4.0; ISO 400; 35.0 mm.